Registration will open on Baum's Page on August 1st for the 2018 Oscar Grant Maplewood Invitational! To enter your teams for the meet - please email Ted Rupe (ted.rupe@gmail.com) with your intent to participate. Past Maplewood Invitational Results can be found on the Results Page. To honor Oscar Grant, we have renamed the Maplewood Cross Country Invitational "The Oscar Grant Maplewood Invitational". 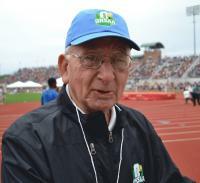 Oscar started the track and cross country programs at Maplewood High School in 1959 when the Greene, Mecca and Johnston Schools consolidated to form Maplewood High School. He coached the sports with much success from 1959 through his retirement in 1986. He continued his work in the sport as an official to the present day. Born in 1924, Oscar is veteran of World War II. He has brought much recognition to Maplewood Schools and Maplewood Athletes and is more than deserving of the meet being name in his honor. Mr. Grant passed away shortly after the 2014 invitational on September 10th, 2014. Thursday, August 30th, 2018 - The meet will be held at Maplewood High School. Maplewood High School is located on State Route #88, ¼ mile east of Rt. #46 (Mecca Center). · Any invited school is eligible to enter as many runners in each race as they wish. Schools are to reply ASAP with their intent to participate by emailing ted.rupe@gmail.com ASAP and reserving a spot for your school. Next fall, rosters of the athletes are to be completed. A link will be made available on this page in early August for you to do so. Rosters must be submitted by 2:00 PM on Monday, August 27th. Rosters are to be submitted on the www.baumspage.com. Four races are held - junior high boys, junior high girls, high school boys and high school girls. All runners will compete together in the same race regardless if they are individual, team or junior varsity runners. You must have a minimum of 5 runners finish a race to be eligible for team scoring. If you have more than 12 runners entered in a race, you may split them into "A" and "B" squads if you wish, as long as you designate names assigned to each squad on your roster sheet. There is an additional $15 fee for each additional "B Team" competing in a race for a school. No more than 1 team per school will be eligible for team awards. The first 5 finishers for a team will be scorers, the following 2 will displace, but not score. Any entries beyond the first 7 finishers for a school will not affect the team scoring. No designations as to individual or team runners need be made in advance. Jr. High Race is for 7th and 8th grade runners only. The top three teams in the high school races and the top two teams in the jr. high races will receive team plaques. The top 25 individuals in the high school races and the top 15 individuals in the jr. high race will receive individual awards. High schools will pay the lesser of $55 per team or $8 per individual. Jr. High schools pay the lesser of $35 per team or $6 per individual. A maximum entry fee of $150 (plus an additional $15 for each "B Team" entered) will be collected from any school, regardless of number of individual or team entries. Checks should be made payable to: Maplewood Running Rockets. Entry fee checks are to be made payable to "Maplewood Running Rockets" and mailed to Maplewood High School - c/o Mark Yoder - 2414 Greenville Rd. - Cortland, OH 44410. Entry fees must be received prior to the meet. Rosters will be submitted by logging on to www.baumspage.com and clicking on the "Maplewood Invitational" tab. Rosters are due by the Monday prior to the meet . There will be no additions or substitutions to rosters on meet day. Make sure that you include all athletes that might participate on the online roster. 1. Each runner must wear the assigned chip number during the race on their shoe. 2. Additional numbers can be obtained at the registration table until 3:30 AM. 3. Chips must be returned by the coach at the end of the meet. 4. Runners must report to the clerk at the starting line by 10 minutes prior to the scheduled start of their race. · Times will be provided at each mile mark for each race. · The Maplewood Athletic Boosters will serve refreshments at the registration building. · Invitational T-shirts will be sold at the registration area. · Restrooms are available at the east end of the school. · No spikes may be worn in the school! Results for previous Maplewood Invitational and other years are available on the www.gopherarun.com results page.